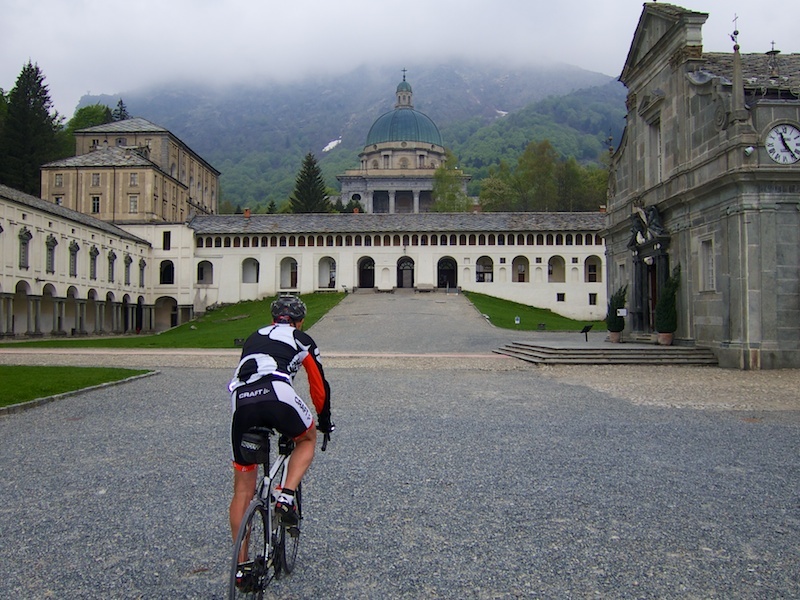 The “Santuario di Oropa” is a UNESCO World Heritage Site and will host the stage 14 mountain finish in the upcoming Giro d’Italia. The Sanctuary is the biggest sanctuary dedicated to the Virgin Mary in the Alps. It is a series of religious buildings, monuments, religious trails, etc. beautifully situated at 1159 metres surrounded by high mountains. Official Site. 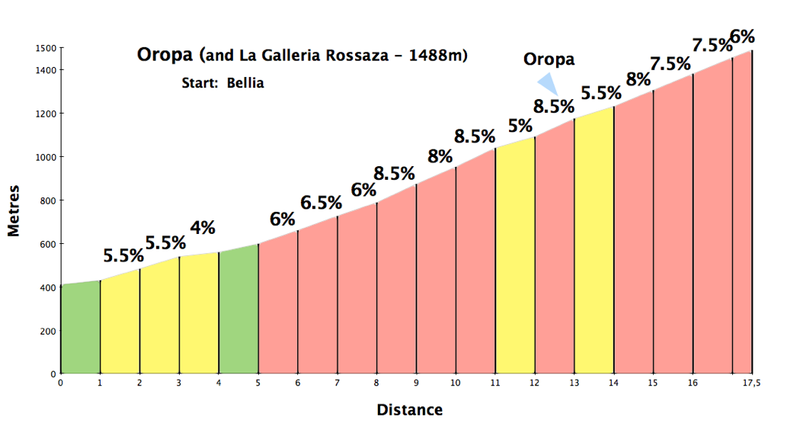 Starting in Biella, it’s a nice enough climb. Quiet, through forested hills, but until Oropa, it is nothing too special. But the Sanctuary itself is very impressive, and well worth the effort. However, the real cycling fun starts here. From the Upper Basilica there is a wonderful little cliff road that climbs up the side of the mountain. A road works car stopped me and told me that the road was impassable with four metres of snow at the Galleria. Unfortunately, because I thought I would be doubling back, I took no photos on the way up. But the views are fantastic. Both the views of Oropa well below, and of the surrounding high mountains. 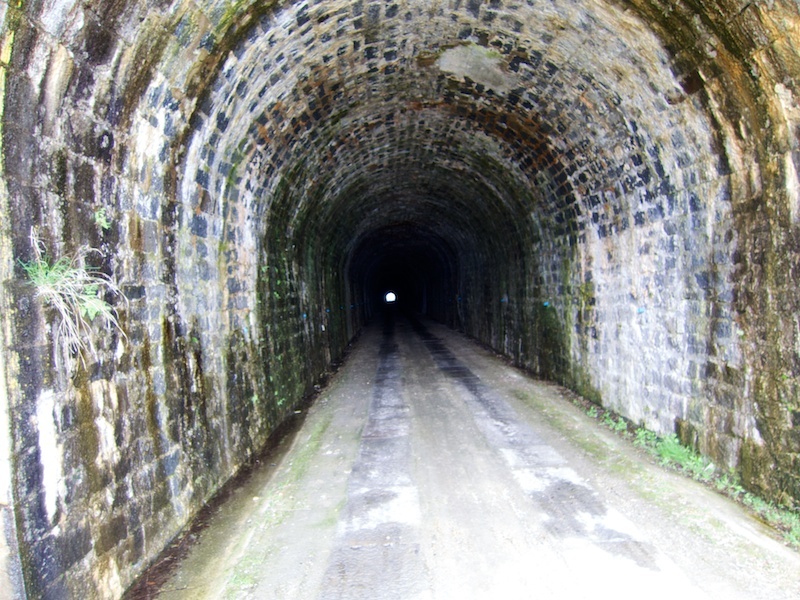 At 1489 metres I discovered that La Galleria Rosazza was a tunnel. La Galleria Rosazza was dug/built by hand during the 1890’s to connect two sides of the bigger mountain. I hate tunnels! And this one was unlit, and very wet. But at least it was straight. I gathered up my courage, and headed in. And as promised, I found four metres of snow blocking the exit. This side, if anything, was even more fun of a cliff road than the Oropa side. But the descent soon became more difficult than expected. 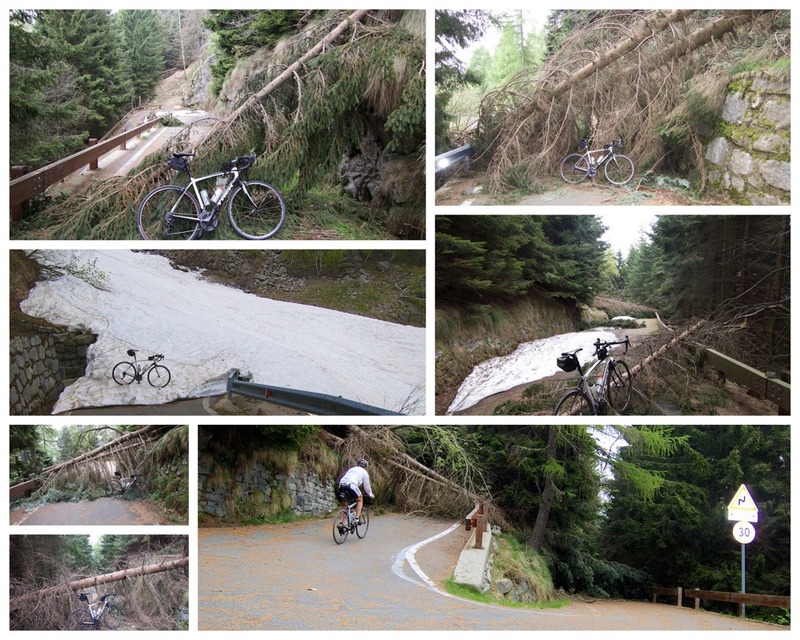 Aside from some manageable snow, trees were down everywhere, and road barriers were ripped apart from avalanches. On the bright side, it was nice to have a good excuse for once for descending so slowly. 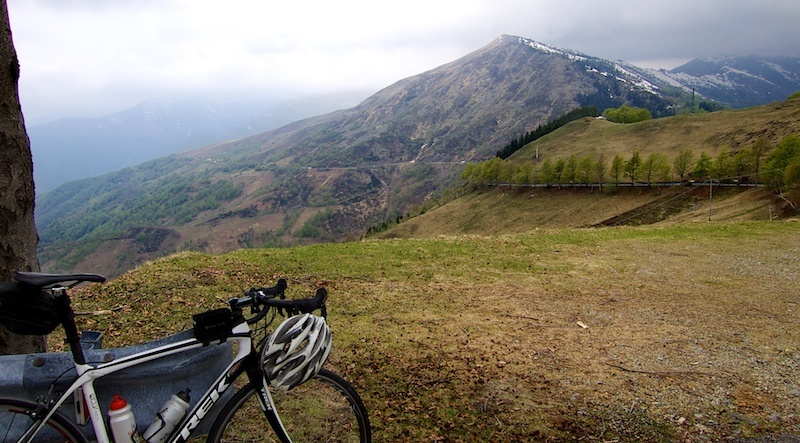 After 8 kilometres of descending the small road meets the Santuario di San Giovanni. Here, before descending back to Biella, i turned up to visit the small ski station of Bielmonte. This road was also signed as closed …. but was ultimately far less adventurous. I really enjoyed this climb. Not remotely steep, on a wide road, and despite the lousy weather lots of beautiful views. Perfect for my tired legs. Above the tree line I bumped into work crews clearing avalanche damage and preparing the road for the Giro (they’ll descend this before climbing to Oropa. Finally, a 29 kilometre descent back to Biella. 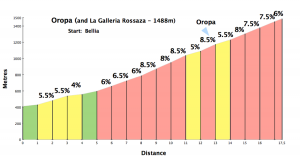 The Giro guys will fly down this not-too-technical road. But they better look out for the cobbled village 2/3’s of the way down! I can’t recommend this route enough. But you might want to wait until at least July for the cliff road to be properly cleared. This ride would be worthwhile just t visit the beautiful Oropa Sanctuary. But for a cyclist the real fun is up higher riding the magnificent little cliff road on either side of the Galleria. Looks epic but are you crazy?!? Btw, Oropa is my new favorite place name. Sounds happy. Thanks so much for posting this. 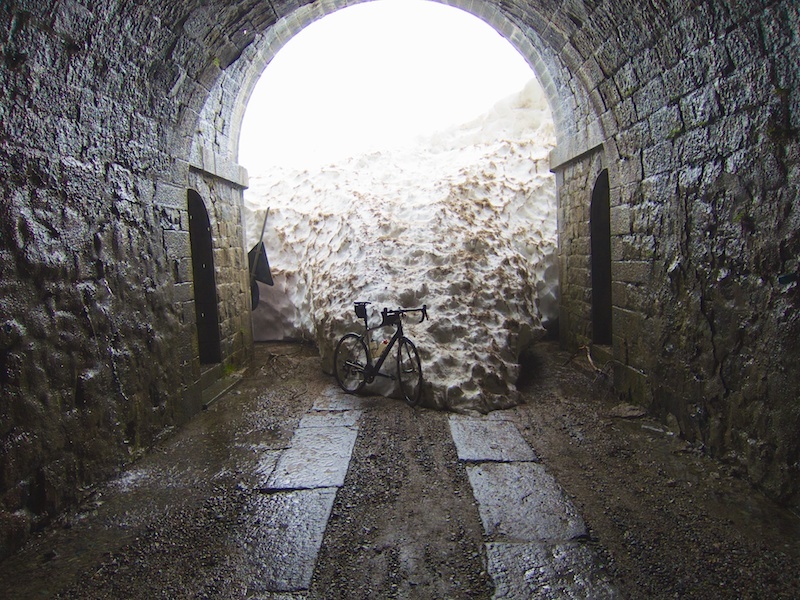 I will be traveling here to watch the Giro this year and of course bringing my bike. My wife is planning on waiting for me at the Santurario, is there much to do up there, it looks really impressive. I also plan on doing Montecampione the next day, have you been there? Yes, plenty to do at Oropa. There are Tours of the various buildings including the Basilica. Several walking trails to interesting shrines, etc. There are also several gift shops and a bunch of restaurants and snack bars. No, I have yet to visit Montecampione but it looks great.